Campus Tour is specially and frequently hosted by VJU in order to welcome special guests and delegations to visit and experience studying and working environment at VJU. Campus Tour presents VJU image reflected by view of people who always love VJU and put their faith in a new model university which will become one of the best choices for the youth not only in Vietnam but also all over the world. 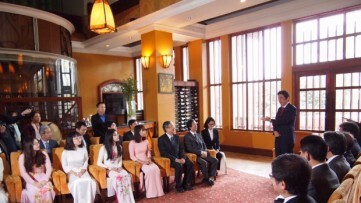 During the 3 - year running period, VJU has welcomed a lot of visitors, varying from Vietnamese and Japanese politicians, universities representatives, entrepreneur and organization leaders. In the very first time of 2019, let's meet special visitors who once visited VJU and became VJU partners. To VJU, Tsutomu Takebe, is not any special guest but the "a family member" of VJU students, lecturers and staffs. During the past 3 years, he was along with VJU from the very first step and has been supported VJU a lot. Flashbacking the first talk between Takebe and VJU 1st Intake student, he shared: "The next era belongs to Asia. The world is changing, so is Asia and VJU will be among the drives behind such changes. VJU will nurture knowledge in a multi-religious, multi-national and multi-cultural environment, realizing peace and prosperity. 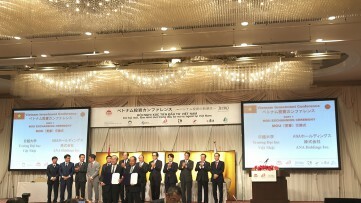 The symbol of this ideal is the Vietnam Japan University, the first graduate school in the world to adopt sustainable science as the mainstream guideline”. In the Q&A session, he said Japan’s leading universities such as Tokyo University and Hokkaido University also started from nothing. Therefore, a university’s prospect does not lie in facilities or policies but rather, in efforts and development of every student. Mr. Takebe Tsutomu conveyed 3 Cs "Chance – Challenge– Change” to students as a message to urge them to make VJU "the Asian Harvard”. "The next era belongs to Asia. The world is changing, so is Asia and VJU will be among the drives behind such changes. VJU will nurture knowledge in a multi-religious, multi-national and multi-cultural environment, realizing peace and prosperity. 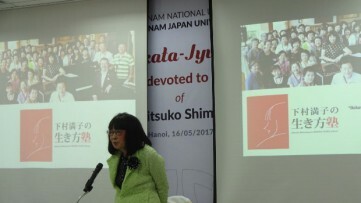 The symbol of this ideal is the Vietnam Japan University, the first graduate school in the world to adopt sustainable science as the mainstream guideline”. In November 5th2018, nearly 3 years from the first time Takebe had his talk with VJU first intake students, he visited VJU and met VJU 3rd intake students with Liberal Democratic Party Diet Members, to observe the way how VJU, the special one part in his heart, has grown up.